Observing the current discourse on Agroforestry, you may get the impression that this agricultural system would only suit the tropics. One widely used argument is that the processes in Agroforestry systems in Mediterranean or temperate climate would be too slow to meet higher productivity demands. But as the Swiss farmer Ernst Götsch, founder and face of the Syntropic Farming movement, thinks differently: “[Agroforestry] also works in these climate conditions. You just have to combine the right species, observe and manage”. His major tool is mimicking nature: by working according to its rules, you also follow the laws of syntropy where, contrary to entropy, more energy is generated than it has been invested. Ernst Götsch learnt about how to integrate trees into agriculture as a child of a farmer family in his home country Switzerland, and therewith in temperate climate. “Having cows between apple or pear trees, together with gooseberries, carrots and chives was common”, remembers Ernst. When he came to Brazil in 1976, he was fascinated by the contrast between the rainforest’s impressive biodiversity and the bordering huge pieces of degraded and dry land. He decided to cultivate such a land in the region of Bahía which has been formerly used for cattle and timber production. Today he restored 350 ha successfully and sells cocoa beans to Italy’s most expensive chocolate producer Amedei, at four times the market price. The Swiss farmer developed a highly productive system which takes all the complexity of the ecosystems into account, not using any chemical inputs. He follows strictly the ecological succession of species to use the maximum of sunlight by all different strata. Thereby, the right choice of companions and their spacing is crucial, not only for the natural flow of nutrients but also for the ecosystem’s communication system, the mycorrhiza. This all favours a healthy relationship towards insects and helps the planted species to protect themselves against what are called pests:“transform your enemies in your allies”, as he always repeats, “everything and everyone has its function, its own task”. 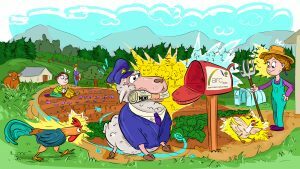 Syntropic Farming is gaining in popularity, with small- and large-scale farmers, activists, political actors, curious researchers and students. A new generation consider his system as an advanced form of agroforestry, with its potential to reconcile high productivity demands with large-scale regeneration. But Ernst also attracts passionate permaculturists, hobby gardeners or individuals who just want to live the example. Two of those are Ryan Botha and Karen de Vries, a couple from Cape Town who decided to make their dream come true, living completely off-grid and sustaining themselves by what they plant. 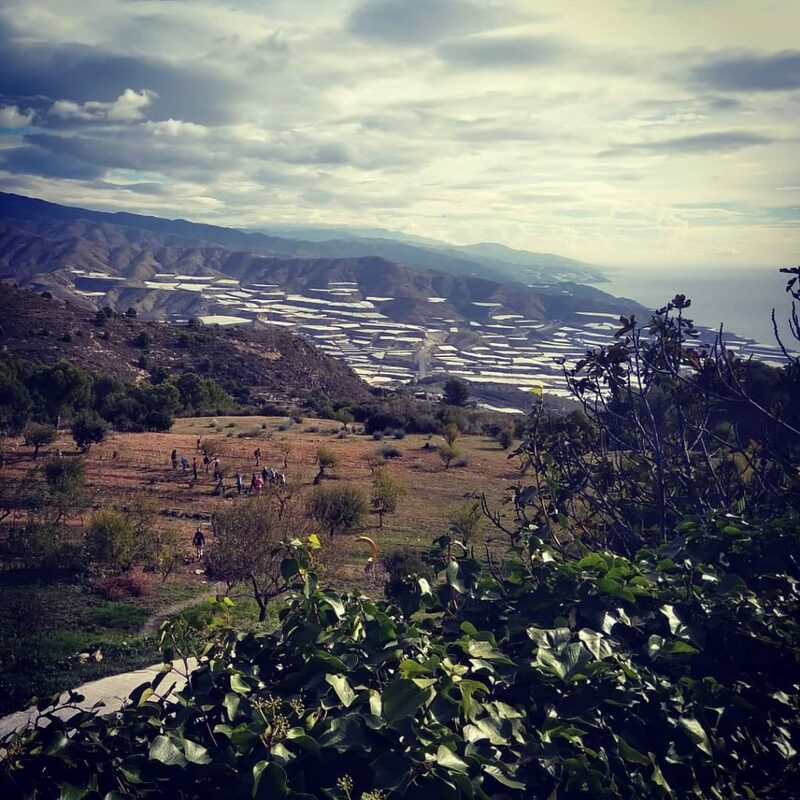 The place they chose, a land in Southern Spain, dry and degraded, which rises now after nine years as a flourishing hill over Granada’s coastline. Inspired by this powerful picture, and most of all by their own power to convert this land into a fertile source of life, they named their recreational centre accordingly, La Loma Viva (The Living Hill), which serves now as a teaching space for Permaculture and mindfulness. 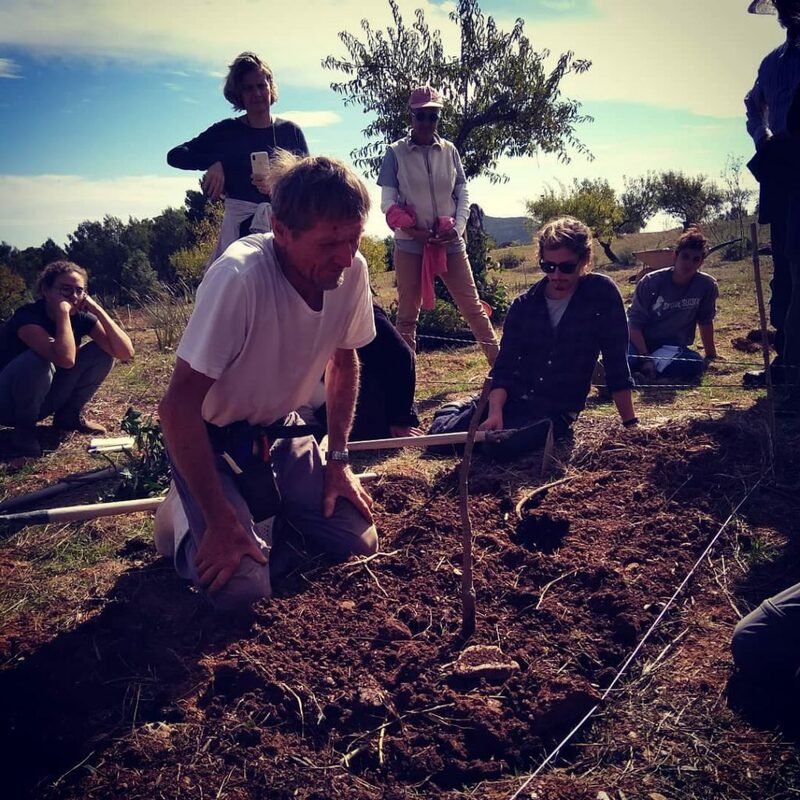 Last October, this author was lucky enough to meet Ernst there, planting seeds for a Mediterranean food forest, supported by a group of 25 people who attended his Syntropic Farming workshop in Spain. “We are so happy that we can organize this workshop with Ernst for a second time now! The design we implemented last year with Ernst shows, it works. But we still can learn a lot, especially about the management and pruning after”, Karen explains. 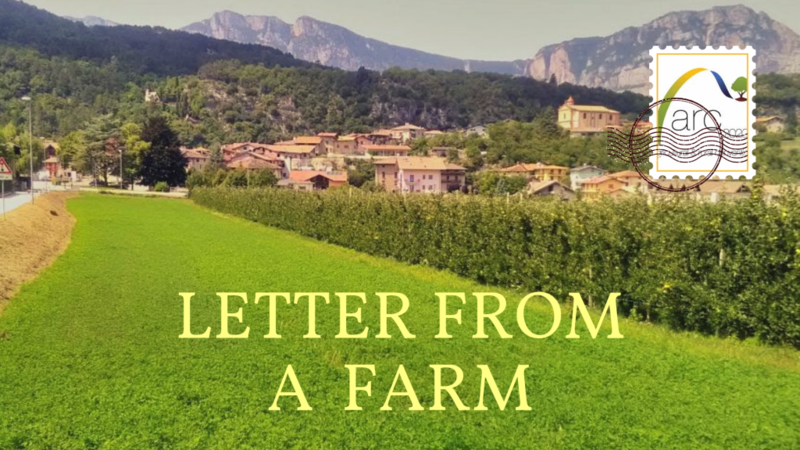 Looking upon the rows of perfectly aligned poplar and almond trees, together with vine, mulberry and pepper, crossed by lettuce, carrots and radish seeds, it is difficult to ignore the distant greenhouses of Spain’s conventional farming – a jarring incongruous vista. A suffocating, smothering blanket of white plastic envelops the landscape around La Loma Viva. Almería’s greenhouses can be seen from space, but on the ground have been exposed for their inhumane working conditions. As the Guardian reported in in 2011, “migrant workers from Africa liv[e] in shacks made of old boxes and plastic sheeting, without sanitation or access to drinking water” and further, “wages […] are routinely less than half the legal minimum wage”. All the more reason then, to ramp up agroforestry – “there could be no more motivating place to prove that we can do better” as a workshop participant pointed out. 1) Ecological succession: the process of changing species when a climax community evolves, each consortium creates the conditions for the next consortium and its composition of species, complexity and efficiency are increasing. 2) Companion planting with higher density: consortia of plants which are beneficial for each other, higher density optimizes the use of space, sunlight, nutrient cycle, mycorrhiza. 3) Evergreen: permanent soil cover with plants or organic matter (from weeding, pruning or removed plants) -> to sequester carbon, prevent soil erosion, store water, give nutrients + support soil life. 4) Pruning: cutting branches to rejuvenate maturing plants, accelerates the growth rate, increases the amount of sunlight for other plants, increases nutrient cycle, directs process of natural succession. 5) Trial and error: Continuous cycle of observing, acting and learning. 6) –> Higher productivity by accelerating the natural processes (nature is the most efficient system). It is true that the FAO made efforts to implement Agroforestry into policy agendas and published its Guide For Decision-Makers (FAO, 2013), where hints are given about legal changes in the Northern hemisphere. As the FAO report points out, “at the European level, tree-based intercropping systems were accepted for access to funding support from the Common Agricultural Policy of the European Union [in 2001]. 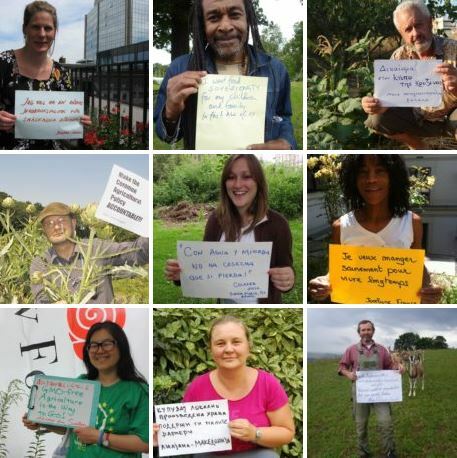 In 2004, the European Commission launched Article 44 for support to agroforestry.” After strong lobbying, France finally adopted this law “giving access to subsidies for agroforestry plots from 30 to 200 trees/ha”. The situation in Germany seems to be contrary according to Christopher Morhart, research scientist at the Chair of Forest Growth from the University of Freiburg. The Agroforestry expert explains that “there are no incentives at all for German farmers to implement agroforestry systems on agricultural land, except the well-known meadow orchards. They would not even lose the EU subsidies, but they would additionally face a higher amount of bureaucracy”. 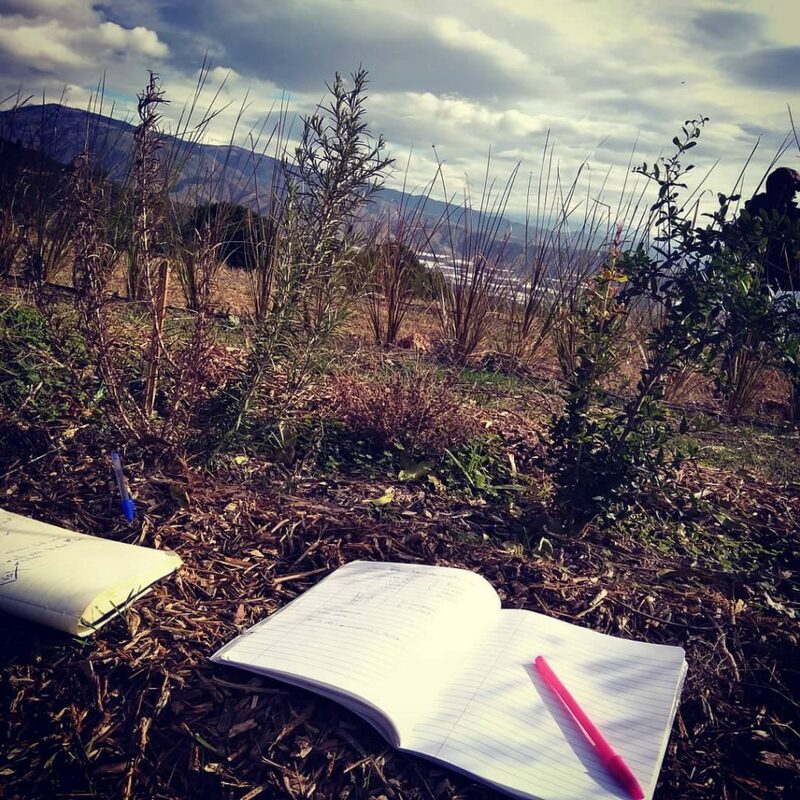 Apart from that, the university’s experimental Agroforestry plots were mostly used as a tool to increase the productivity of timber production, which is also proved by the faculty’s research focus and the students’ lecture material. The association of the forest with food production is unfortunately not supported by the current curriculum. If the Swiss farmer is not climbing up to prune his trees in the Brazilian jungle, he spreads his knowledge in workshops, not only in Spain, but also in Portugal, France or Germany, giving people hope that there is still the possibility to divert the world’s ongoing trend. JR: Can you describe what you mean by Syntropic Farming? EG: The roles, according to which life functions, are the same on the whole planet. Following them, for this will work in any situation, and in whatever climatic condition. You just have to figure out first the most efficient consortiums of species, appropriate to the peculiarities of each site, and the tasks to be resolved upon it. For this, choose for what you perceive, that it would be indicated in terms of species to have their participation. Introduce them! And do it in a way, as nature would do it, as nature would realise it. Secondly, always be conscious, that the aspects of movement and metabolism are intrinsically linked with life. So don’t ‘conserve’ – no to conservation! Life is succession, species succession. Species succession is the means used by life to move itself in space and time. So observe – and learn to observe! Dialogue, in lieu of trying to impose. Practice as a farmer in each one of your professional interactions with Mother Earth, plants and animals empathy, empathy with the object, with which you work, on which your, our, sake depends. And then try to manage your complex agro-eco-systems in an appropriate way. 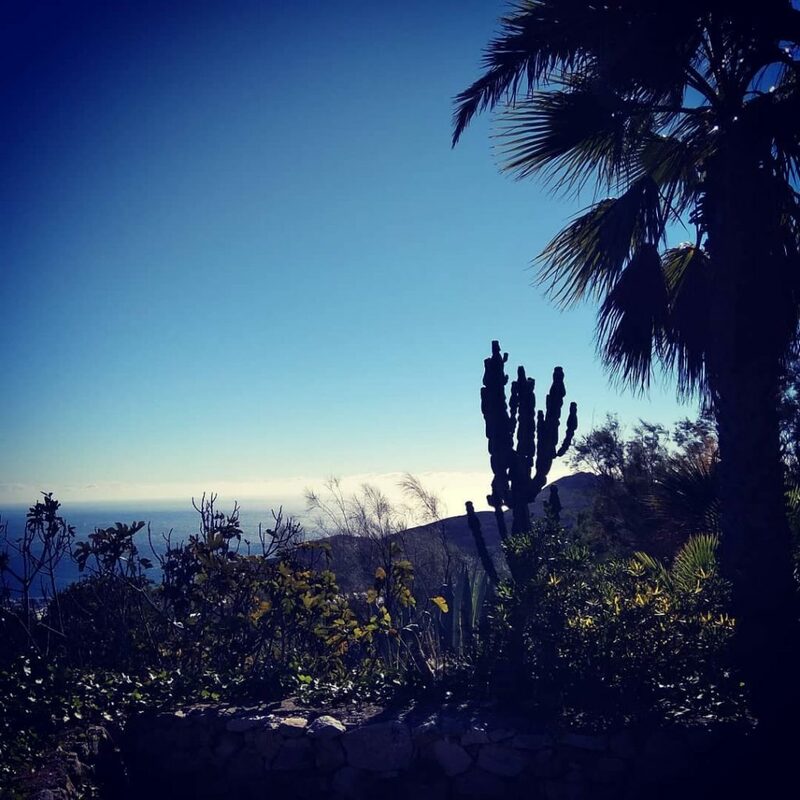 Focalize on the increase of quality and quantity of established life, and on a positive balance energetically, considering both, the site of your intervention as well, as the macro-organism Planet Earth. Be aware, that there doesn’t exist ‘good’ or ‘bad’. Healthy and vigorous, our agro-eco-systems, our plants, and our live-stock will be, when we manage, to interact in an appropriate way, this would be primarily, by choosing for love and peace. This is, by living and applying in our day to day interactions the principles of unconditional love and cooperation. The path to life. Peace- farming. Whereas our actually dominantly used principles concurrency and rough competition, believed and taught as being the bases of all inter- and intra-specific relationship, result, put in practice, in scarcity. This by its side, stirs up conflicts. Conflicts result in war. And war is the path to death. Pests, and diseases, are more like agents of the immune-system, of the macro-organism Life-on-Earth, integrants of the ‘department for optimization of life-processes’. They indicate to us the errors we have committed in our design for our plantations and / or in the interaction with them, and give us – if we accept them – hints in how to behave in a more intelligent way. And weeds will occur, when our designed, and then planted system is incomplete. All these above outlined principles integrally applied in our day-to-day activities as farmers will result in what I would describe as ‘syntropic’ farming. A way of doing agriculture, in which the major external input needed is knowledge and we will approximate ourselves to it: when the balance of our operation turns to become positive, energetically as well as in terms of established life. And we will get closer, when our interaction turns to be beneficial for all the involved and submitted parts to our 0peration, and when it turns to be serviceable for the eco-system. JR: Can you describe your farming background in Switzerland? How was it relevant to what you do today? EG: “I still experienced in the mid of the last century, as a child of a farmer family in the north-east of Switzerland, the integration of significant remnants, of some – on that place – centuries ago designed and established agro-eco-systems, with their – to that region typical – generous integration of hedges and huge fruit trees in the agricultural land-scape. Agriculture, specially working with plants, early became my passion. When I first time went to a visit to Brazil in 1976 – at that time I was engaged in Zürich, in an institution for plant breeding and -improvement – I was shocked, when I faced crossing that beautiful country, on thousands of kilometers, often on both sides the high roads, vast areas, millions of hectares of recently cleaned’ landscapes with monotone, mostly soja- or corn- plantations. The roaring noise of big machines had replaced the harmonious and enchanting chorus consisting of thousands of birds, which once had their home in the recently removed forest. And replaced too, the scent of flowers and fertile earth of that forest. Substituted by the smell of pesticides in the air, paving the – our, modern man’s – road to death. In contrast to that scene, at that time there was still a seemingly endless landscapes covered by – exuberant forests. This was LIFE ! Especially for me, accustomed to Middle-European parameters of forest. The dynamics of those natural and original eco-systems could – should – become the dominant pattern for our future agro-eco-systems. When I went back to Europe, I decided to test and put in practice this idea. Cautiously I began with a combination between complex sequences of crops-rotation, consortiums of different crops and an integration of hedges. Countless tests and experiments, which I had done in this sense in the next following three years, brought me to the definite conclusion, that the key to be used for a successful approach to achieve what we need to satisfy our metabolism is to focus on the eco-system, on our agro-eco-systems as a whole, that is to say, to approximate those in their dynamics as close as possible to the natural and original eco-systems of the places where we decide to do agriculture. In order to prove that the above designed concept, put in practice, functions, I acquired in 1984 a piece of partially heavily degraded land in southern Bahia, Brazil. I reforested it, and decided to live off the agricultural production of that site. In the meantime, in numerous places, in different eco-systems, with different crops, ranging from vegetables, grains, tree-crops, or the combination between different activities, I would bring together all I have learnt during the last 70 years, since my childhood, and say: “You would like to produce more food, and food of better quality, plant trees! And if you had any doubts about the ‘too much’, plant more trees! And then learn to manage those trees, learn to prune trees! Julia Ruff is a master student of the Global Studies Programme, a joint-degree of the University of Freiburg (Germany), University of Cape Town (South Africa) and the Chulalongkorn University (Thailand). She focused her research on the management of natural resources and more particularly on that of food systems, analysing the practices of agribusinesses, philanthropic organizations and governmental initiatives from the perspective of Political Ecology. Based on her research results and personal experiences, she shifted her interest from Green Economy and Green Finance towards Regenerative Landscaping and therewith, to Agroforestry. 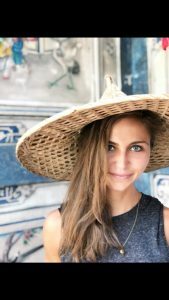 Julia Ruff is a master student of the Global Studies Programme, a joint-degree of the University of Freiburg (Germany), University of Cape Town (South Africa) and the Chulalongkorn University (Thailand). She focused her research on the management of natural resources and more particularly on that of food systems, analysing the practices of agribusinesses, philanthropic organizations and governmental initiatives from the perspective of Political Ecology. Based on her research results and personal experiences, she shifted her interest from Green Economy and Green Finance towards Regenerative Landscaping and therewith, to Agroforestry.